RadioShack has been one of my top stores for buying gifts - no matter what the season or occasion! They have always offered great Christmas gift ideas, Father's Day gift ideas, and so much more! Today, I want to share one of my favorite Grad gift ideas! My sister recently graduated from high school and I gave her an awesome Aluratek 8" Digital Photo Frame from RadioShack! What’s the point in printing out dozens of pictures when you can display all of them on a true color LCD screen? 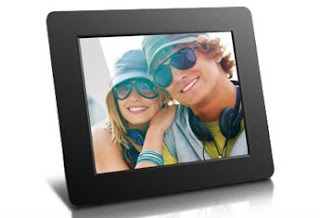 The Aluratek digital photo frame is easy to use and will showcase your family pictures in an 800x600 resolution. It is going to be awesome to display all of her pictures of ME to all her new friends at college! :) But honestly, this makes such a great grad gift because when kids make the first big move away from home, this is an easy way to remember friends and family, look at their pictures and show them off to friends often! My sister LOVED this gift and she couldn't wait to open it and upload all of her pictures! She especially loved how easy it is to use - you just simply insert your camera or camcorder's SD™/SDHC™ card or a USB drive directly into the frame and your pictures will automatically display in a slideshow mode! She can't wait to decorate her dorm room with this frame! Grads can be hard to buy for! Next time you are stuck, head over to RadioShack and check out all their great grad gift ideas! Buy It: You can purchase the Aluratek 8" Digital Photo Frame for $44.99 online only at RadioShack's website.